It may be a little inappropriate to post this near bedtime, but it's not that late compared to my normal holiday schedule so here's the post. For the last two weeks I have been going to places on the spring break to-do list. Cartems Donuterie, one of the most-reviewed place on Urbanspoon, has successfully captured my cravings for donuts in the past two weeks. Unlike coffeeshops, Cartems Donuterie specializes in a simpler menu- donuts and coffee. The price was $3 for 1 donut, $15 for 6 or $30 for 12. Their donuts are a little bit pricey, but it does depend on personal opinion whether if they're worth the price. Time to open the box. I arrived there around 4pm, not too close to their closing time but there were some flavors still missing. Fortunately, the Vegan Earl Grey (the donut on my list) was still available. Let's take a closer look at the inside. Compared to the other non-vegan donuts, this one somehow tasted lighter in the "Cake" part. I love tea-infused desserts, and this one made it on the list. The earl grey flavor was there, and the sweetness did not hinder the aroma at all. Chocolate donut topped with white chocolate ganache and organic coconut flakes.This one was a combination of both coconut and chocolate (exactly half and half actually, since chocolate is usually quite heavy) and the ganache reduced the slight dryness from the donut as well. Don't be fooled by the color of the donut (soil colored? up to your interpretation). This chocolate-almond flavored donut is topped with caramel and nut-chocolate flakes. Interesting combination of ingredients. I was a little hesitant when I chose this one, but the Parmesan actually turned out to be a great dessert-ingredient! Sweet Parmesan cheese with drizzled honey glaze...I love the creativity on this one. Simple ingredients on the outside yet amazing taste on the inside. Original donut with cinnamon sugar and light glaze. Last but not least...the bacon donut. Honestly, bacon taste good with anything (from a Canadian's point of view at least) and Cartems Donuterie has achieved this statement again with this popular donut. Candied bacon with whiskey and maple-flavored glaze all in one donut.After reading the description on their website that this donut is made with bacon fat, I guess this might be the unhealthiest of all 6. 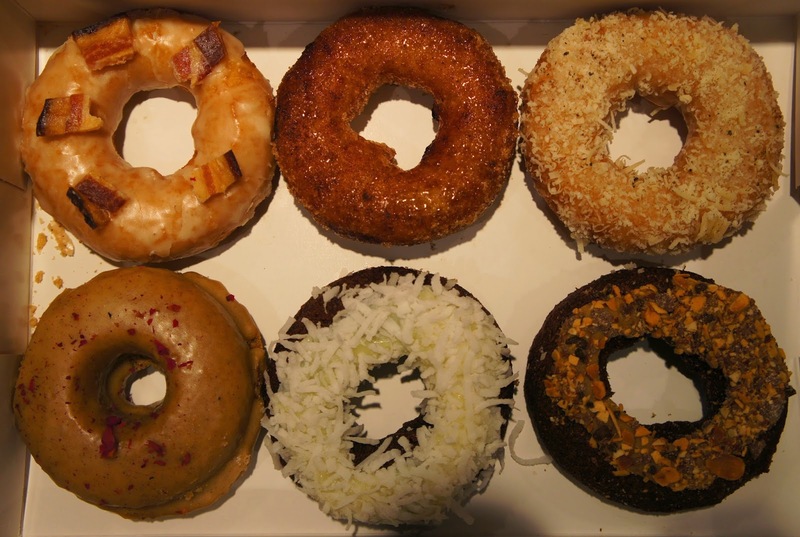 I love this place overall- from its clean, warm ambiance (quite distinct compared to the East Hastings neighborhood), its convenience location (a 2-3 minute walk from Waterfront Station), and of course, the donuts. I'm usually not a donut person, but these donuts are pretty worth the hype.